A recent study tested a variety of probiotic (beneficial) Lactobacillus and Bifidobacteria species of bacteria as a treatment for chronic sinusitis. Unfortunately, it found that the microbes tested had NO effect on chronic sinusitis symptoms. It was a nice study conducted in Sweden, with 21 people with chronic sinusitis (but without nasal polyps) randomly assigned to receive a nasal spray (that they used 2 x daily for 14 days) containing either a mixture of 13 bacteria or a "sham" nasal spray. No one knew who received what, and then after a few weeks they did a crossover - meaning who got what was switched for another 2 weeks. But...the main finding is that after 14 days of using the nasal sprays, there was no improvement in either group, no improvement in symptoms, no effect on the sinus "microbial flora", and no effect on inflammation. In fact, 2 individuals wound up taking antibiotics while testing the bacteria nasal spray. In other words, a big fat zero. The bacteria tested were what the researchers called a honeybee lactic acid (LAB) microbiome, with both Lactobacillus and Bifidobacteria species: Lactobacillus apinorum, L. mellifer, L. mellis, L. kimbladii, L. melliventris, L. helsingborgensis, L. kullabergensis, L. kunkeei, L. apis, Bifidobacterium asteroides, B. coryneforme, Bifidobacterium Bin7N, and Bifidobacterium Hma3N. 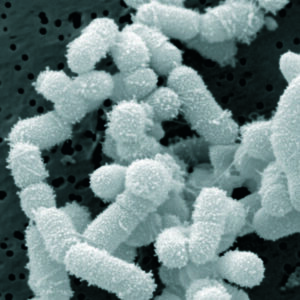 These species are not typically found in probiotic supplements. Why did they choose those strains of bacteria? Because "in vitro" testing (meaning in a test tube or culture dish) suggested that they would be effective against the pathogenic bacteria frequently found in chronic sinusitis (that they were antimicrobial). But real world testing in actual humans in this study showed that those specific Lactobacillus and Bifidobacteria microbes had no effect on sinusitis symptoms. Their premise was good - that the sinus microbiome was "disturbed" or out of whack (dysbiosis) in chronic sinusitis, but unfortunately they chose the wrong bacteria to test as a treatment. A locally disturbed commensal microbiome might be an etiological factor in chronic rhinosinusitis (CRS) in general and in CRS without nasal polyps (CRSsNP) in particular. Lactic acid bacteria (LAB) have been suggested to restore commensal microbiomes. A honeybee LAB microbiome consisting of various lactobacilli and bifidobacteria have been found potent against CRS pathogens in vitro. Recently, we examined effects of single nasal administrations of this microbiome in healthy subjects and found it inert. In this study, we examined effects of repeated such administrations in patients with CRSsNP. The study was of a randomized, double‐blinded, crossover, and sham‐controlled design. Twenty patients received 2 weeks' treatment administered using a nasal spray‐device. The subjects were monitored with regard to symptoms (SNOT‐22 questionnaire, i.e., the primary efficacy variable), changes to their microbiome, and inflammatory products (IL‐6, IL‐8, TNF‐, IL‐8,a, and MPO) in nasal lavage fluids. Results: Neither symptom scores, microbiological explorations, nor levels of inflammatory products in nasal lavage fluids were affected by LAB (c.f. sham). Conclusion: Two weeks' nasal administration of a honeybee LAB microbiome to patients with CRSsNP is well tolerated but affects neither symptom severity nor the microbiological flora/local inflammatory activity. In this study, involving patients with well‐defined CRSsNP, we demonstrate that repeated nasal administration of a LAB microbiota composed of several species of lactobacilli and bifidobacteria over 2 weeks neither affects symptoms as assessed by SNOT‐22 questionnaire nor the bacterial composition or the inflammatory activity in the nasal cavity. The observations are of relevance to the evaluation of topical LAB treatment in the management of upper respiratory tract conditions such as CRS.